Looking for a dual-band mobile phone signal booster? Then look no further! 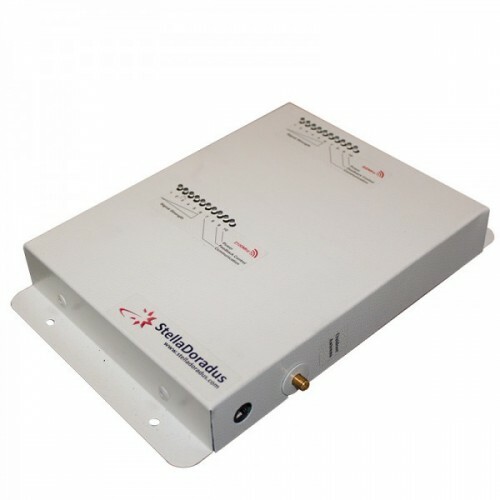 The SD-RP1002-G signal repeater kit from StellaDoradus is the best booster you would ever need. It amplfies to signal band, one for GSM and another for 4G/LTE. Take note though that this model works at 1800MHz (Band 3) LTE. It multi-user supported, where one can use his/her cellphone from a network while another user is surfing the web on his/her cell phone on another network. The SD-RP1002-GD in technical term - is a GSM/4G/LTE Signal Repeater Device. It's ComReg approved, which is safe and legal to use in Ireland, UK and other European countries. The SD-RP1002-GD is designed and manufactured by a Waterford company called StellaDoradus. They are one of the leading manufacturers of legal mobile phone signal boosters in Europe and the only in Ireland. All SD products are fully compliant to European R.E.D regulations and passed all E.S.T.I tests, making it safe and legal to use. The SD-RP1002-GD is ideal for providing strong GSM & 4G/LTE signal coverage in your home or small office. As long as there is signal outside your house/office, this device can amplify it and re-transmit the signal throughout your house or any targetted area. It can cover around 4 rooms. For the repeater to work you must have at least 1 signal bar outside your house on your phone. The device will amplify the received signal and do some filtration and interference control magic. Interference control is some sort of technology that prevents signal noise in a network, so as not to disturb neighboring network on the same spectrum. Actual signal booster installation using the SD-RP1002-GD kit. For the 4G/LTE part, this model only works at 1800MHz frequency (Band 3). So you need to know what LTE frequency your network is throwing you in your area. To install the SD-RP1002-GD booster kit, follow the simple steps below. Note: The unit used in the video demo is not the actual SD-RP1002-GD model. To buy the SD-RP1002-GD dual-band mobile phone signal booster, you can call us to order using this number +353 22 23440 or use the "Add to Cart" button on this page and go through the secured checkout process.